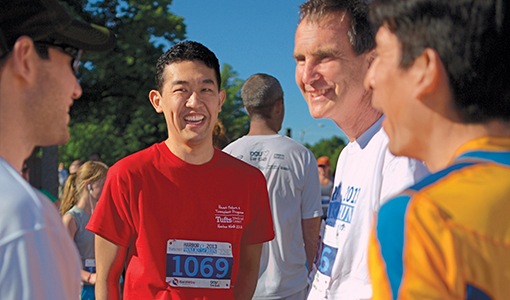 A former classmate’s triumph over heart failure inspired the class of 2014 to raise more than $16,000 for its class gift in honor of Shoji Inomata, D15. The gift will establish a scholarship for a future dental student who has faced significant personal hardship while continuing his or her studies. Inomata started his dental education with the D14s and was doing well until he became ill in January 2012. He was hospitalized for 256 days at Tufts Medical Center and underwent a heart transplant on September 12, 2012. “Shoji had to wait seven months before a donor heart was found, and yet during that time, much to the amazement of everyone, he kept up with his dental studies,” says Kane Ramsey, D14, the class vice president. Ninety-three percent of the class—175 people—contributed to the gift, with 166 of them (a record-breaking 95 percent of those donating) joining the Dean’s Inner Circle for the first time, with donations of $25 or more. Their total contributions of $5,475 were matched dollar for dollar by the dean’s office, and the Dental Alumni Association contributed an additional $1,500. A staff member and two alumni were also inspired to contribute. Inomata helped raise money and contributed to the gift himself. Many of Inomata’s classmates didn’t realize he was sick until he appeared at their white coat ceremony in March 2012 attached to a biventricular assist device (BiVAD), which does the work of failing ventricles in the heart. “After that ceremony, we tried to rally behind him,” Ramsey says. Inomata attended classes with his BiVAD in tow. Yet he needed someone who knew how to use a manual pump to keep his heart beating if the BiVAD malfunctioned. Inomata’s friend, class secretary Michelle Webb, D14, helped recruit 20 classmates who learned how to help Inomata in an emergency. Inomata received a scholarship created by the 2012 class gift, which honored Catherine Dahl, D12, who was treated for stage-three breast cancer while a student and still graduated at the top of her class. “We wanted to pay it forward, following the model of the class of 2012,” says D14 class president Andrew Tonelli, A06.